The former Colorado governor thinks he’s the centrist candidate to take on Trump. Colorado Gov. John Hickenlooper speaks onstage during the 2018 Concordia Annual Summit at Grand Hyatt New York on September 24, 2018, in New York City. Former Colorado Gov. John Hickenlooper, much like Minnesota Sen. Amy Klobuchar, made the case that a centrist Democrat should be the party’s 2020 pick Wednesday night during a CNN town hall. Hickenlooper leaned heavily into his experience as his state’s top executive to highlight his ability to work across competing interests and push through key policies, including more stringent gun control and environmental regulations. He argued that his work as governor could make him the right person to attempt to unseat President Donald Trump. Hickenlooper, a geologist turned brewpub owner turned politician, does have a track record of working with Republicans on issues including expanding Medicaid in Colorado. He was able to steer the policy through a split legislature and secure health care for an overwhelming majority of state residents. But as Vox’s Tara Golshan writes, his record is filled with contradictions. 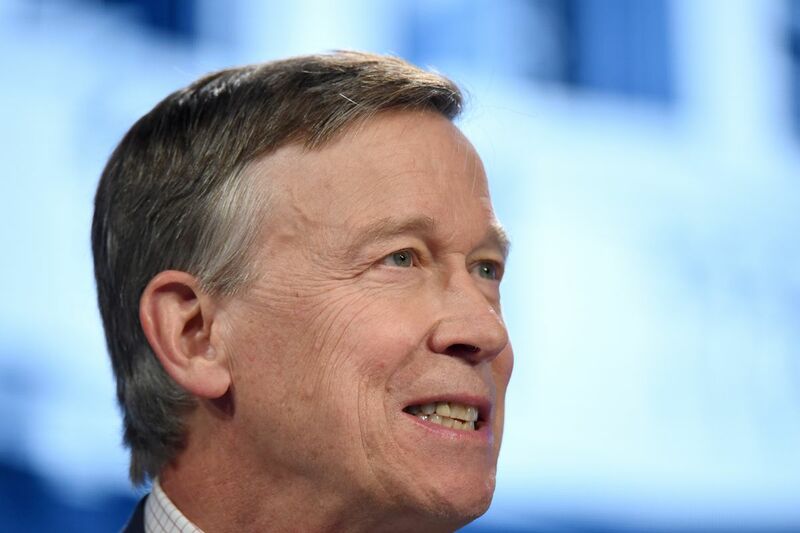 While Hickenlooper did help advance methane rules aimed at curbing pollution, for example, he has also pushed back on regulations that would have kept oil companies farther away from homes, schools, and parks. Hickenlooper is betting that some of his bipartisan bona fides could sway voters fed up with broader polarization. But he wasn’t afraid to criticize Trump directly in certain moments — like when one voter asked about the rise of white nationalism. He also shied away from fully endorsing some key progressive priorities: Although he spoke in favor of universal health care and free community college, he stopped short of endorsing Medicare-for-all and free college. Here are three key moments from the town hall. Colorado, under Hickenlooper, was one of the first states to legalize recreational marijuana, and while he may have initially opposed this step, he indicated that he’s come around and now thinks other states should be able to do the same. Hickenlooper said he supported a path to universal health care coverage but did not back Medicare-for-all. “We are almost-universal coverage in Colorado; we’re at 95 percent,” he said, noting that this coverage was due to a combination of different policies including the expansion of Medicaid and setting up some of the most “innovative” health care exchanges in the country. That puts his ideas into the less aggressive category of plans that Democrats have currently proposed to expand health care in America. As my colleagues Sarah Kliff and Dylan Scott explained after reviewing the nine proposals put forward so far, “there are some that would replace private insurance and cover all Americans through the government. Then there are the others that would allow all Americans to buy into government insurance (like Medicare or Medicaid) if they wanted to.” Hickenlooper’s is the latter. Hickenlooper emphasized that many people are currently satisfied with their employer-provided plan and highlighted this factor as a major obstacle for the potential implementation of Medicare-for-all. “I mean, there are over 150 million people that [have employer-sponsored insurance] — I can’t imagine how we would pull them off health care coverage that in most cases they like,” he said. Hickenlooper, like several of the other white men seeking the Democratic nomination, was asked why voters should choose him over a woman or candidate of color. His answer, while it sought to flip existing gendered expectations, somewhat missed the mark. CNN anchor Dana Bash followed up by asking if Hickenlooper would commit to considering a woman as his vice presidential running mate. “When we get to that point, I’ll ask you that question,” Bash shot back.